Dr. med. vet. MIRIAM KRAUSE MEGCBT, certECBS, M.R.C.V.S. I graduated as a veterinary surgeon from vet school Hannover in my home country Germany in 1997 and have since gained further qualifications in Dog Behaviour Therapy & Training in 2009, Bowen Therapy for people in 2010 and Canine Bowen Technique in 2012. Since 2002 I am living and working in Great Britain, and since 2004, I am enjoying life in Shetland. First in Lerwick and since 2005 in Bixter on the Westside. In August 2010 my beautiful daughter Liena was born. 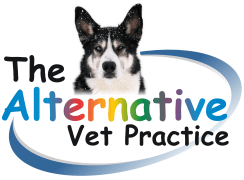 In August 2011, I started my own small part-time business offering Dog Behaviour Therapy & Training and Bowen Technique treatments for people and dogs. 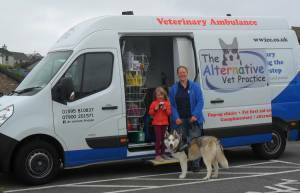 With a desire to expand on this, I opened the ‘The Alternative Vet Practice’ on 01 March 2013. In my spare time, I enjoy travelling, going to courses, and spending my time with my daughter Liena and my dog Malakai. Doctoral Thesis "Development of a method of anaesthesia to reduce stress for the capture of birds for scientific reasons"